Glad Black Bag has teamed up with The Picker Sisters, John Mecier and Keep America Beautiful to clean up those wild moments in life and find ways to reuse the trash. Glad Black Bags make sure that no matter the mess left behind cleanups are in the bag. Keep America Beautiful’s mission is “Engaging individuals to take greater responsibility for improving their community environments. John Mecier is a celebrated mosaic artist who is creating 4 works of art that will be auctioned off (details after the tutorial). The Picker Sisters live by the saying, “one person’s trash is another’s treasure.” They travel the across the country finding trash to turn into treasures for their store. I was given the same challenge as John Mecier to do like the Picker Sisters do and create a Recycled Art Project using recycled items. This is something I love doing. If you are a regular here at The Gunny Sack, you’ve seen my tutorials for other recycled items like wire memo boards with used frames, painted vintage trays, painted leather flower headbands, zipper flowers, brown bag envelopes and a wall hanging from barn wood. 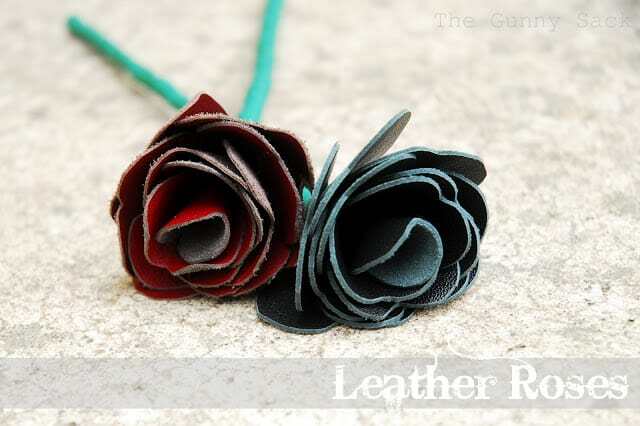 For this project, I decided to make leather flowers. 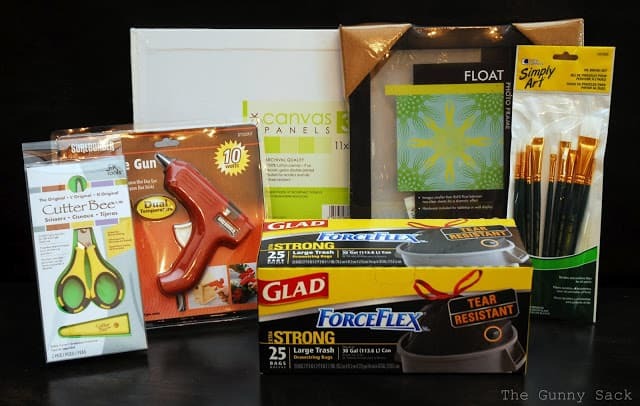 To get me started, I received this craft kit that included 3 canvas panels, a picture frame, scissors, a glue gun and paint brushes. This kit really got my mind whirling with so many ideas that I didn’t know which direction to go! 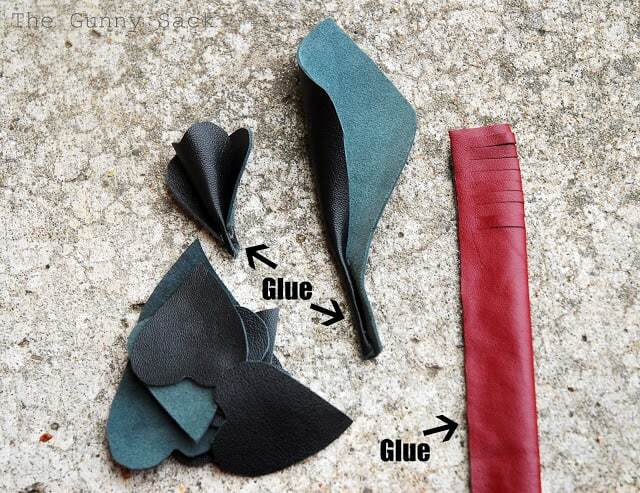 I ended up using scissors, paint brushes and a glue gun for this leather flowers tutorial. In addition to the craft kit, I received a package of Glad ForceFlex Black Bags and they came at the perfect time: Spring Cleaning! I’ve already filled a large black bag with old clothes and can’t wait to fill some more! We always have Glad Black Bags on a shelf in our garage and use them for so many things such as yard cleanup, indoor & outdoor cleaning and decluttering, garage sales, craft sales and even moving. These bags have a diamond texture that stretches to prevent rips and tears. The large sizes can handle big loads and the strong drawstrings make closing easy and dependable. We always buy the drawstring style, but there are also Quick-Tie closures available. Glad also makes an OdorShield black bag that helps neutralize odors on the toughest trash, but we haven’t tried this style yet. I enjoy working with leather. I’ve made leather baby shoes, leather headbands, a leather camera case, a leather sunglasses case and painted leather flowers for headbands. I always use recycled leather that I get from so many different sources. Some of the leather is from our used jackets, some of the leather I purchase second hand and some is given to me by friends and family. 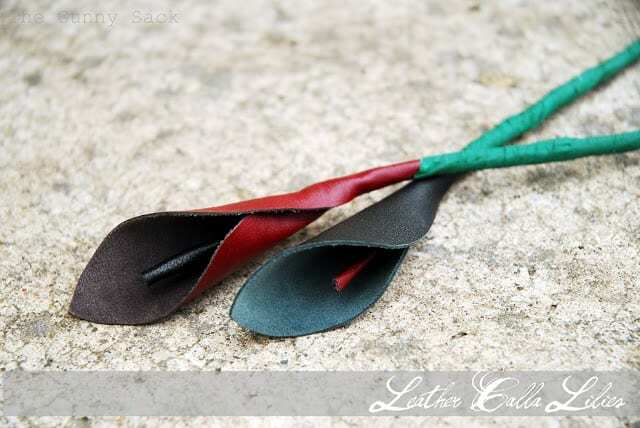 It is hard to find leather in unique colors. I mostly find black and brown leather. 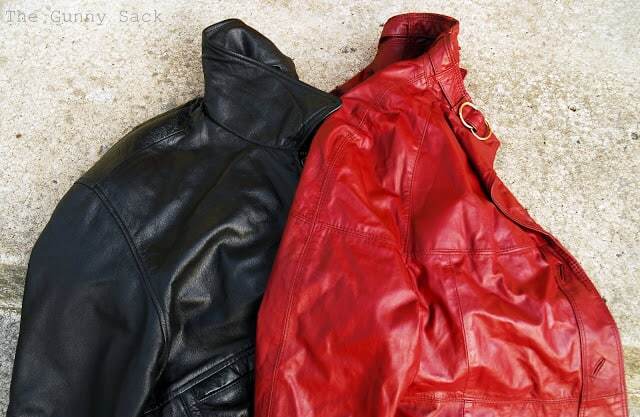 For this project, I used a black leather jacket and a red leather jacket. 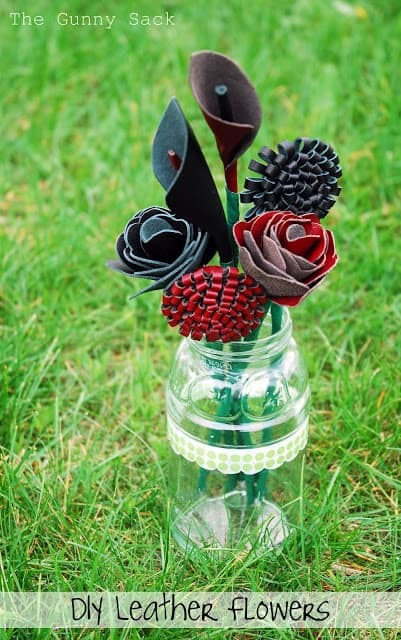 I made 3 different flowers: roses, calla lilies and loopy flowers with no official name. 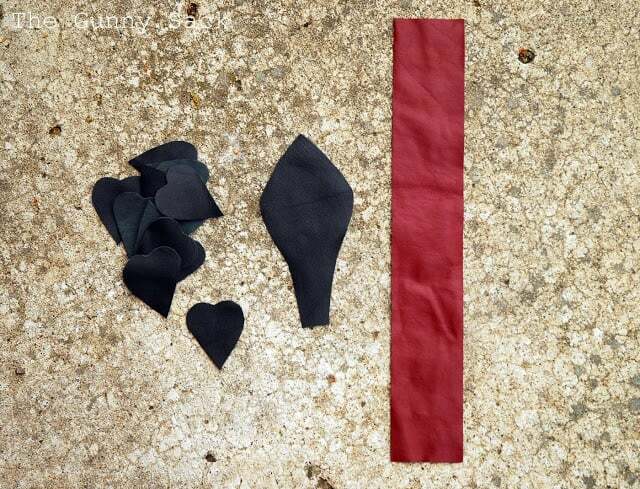 For the roses, I cut out 13 heart shapes. For the calla lily, I cut out the shape in the center which I have no idea what to call…a spearhead?? For the loopy flowers, I cut long strips of leather 2×12 inches long. 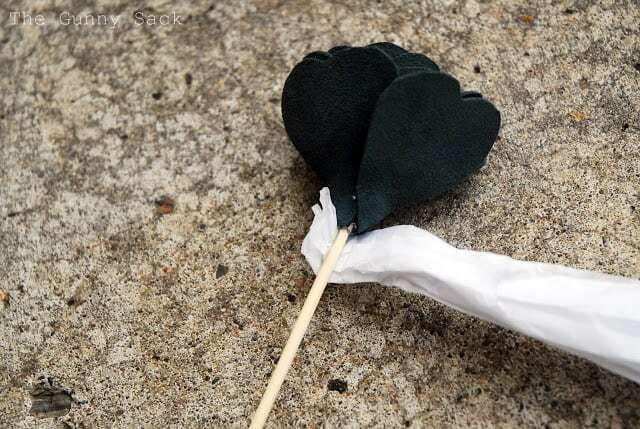 To make the roses, I folded one heart, wrong sides together and hot glued the bottom point. Then, I started wrapping hearts around the center heart, right sides facing in and gluing them in place down at the point. To make the calla lilies, I put hot glue on the long rectangular piece at the bottom and rolled it up. Then, I cut a small strip of leather for the stamen and glued it to the inside of the flower. I ended up cutting off a little of this glued part when attaching the stem because it was too long. 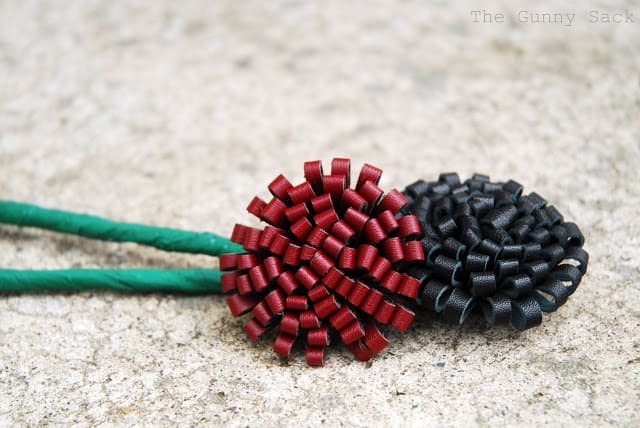 To make the loopy flowers, I folded the leather strip in half and hot glued the edges together. Then, I cut small slits in the leather. I didn’t measure them out but I tried to cut them evenly. Next, I rolled up the strip, hot gluing it in place along the way. To make the stems, I hot glued wooden skewers to the flowers. Then, I took crumpled strips of tissue paper and wrapped them around the very bottoms of the flowers and around the skewers. I used hot glue every once in awhile to keep it in place. 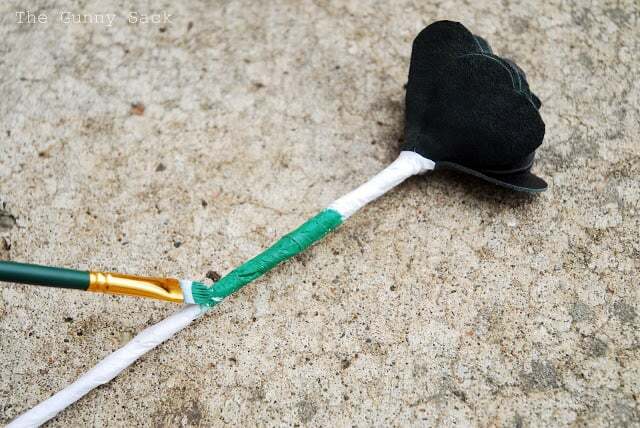 For the loopy flower, I cut a circle of leather that I hot glued to the back of the flower with the skewer between and then I wrapped the stick. Since I used white tissue paper left over from Christmas, I needed to paint it green. I had some craft paint on hand from various projects and had just enough for these stems. I chose not to make leaves and thorns but they would be a nice addition. I love how they turned out and am trying to figure out how else I can use the flowers. These loopy flowers could be put on headbands, hair binders or so many different things because the bottoms of the flowers are flat and therefore easy to attach. The calla lilies are very elegant and although I have never seen a black calla lily they do exist…well they are called black calla lilies but they are actually really dark purple. I put the flowers in a recycled glass jar and put a strip of washi tape around the jar for decoration. John Mecier is a celebrate mosaic artist who created 4 works of art using people’s trash including items collected during Great American Cleanups from around the country as well as items donated by celebrities such as Jesse Eisenberg (The Social Network), Raphael Sbarge (Once Upon A Time) and Nathan Kress (iCarly). These works of art are up for auction right now during the Glad Black Bag art auction on eBay and the proceeds will benefit Keep America Beautiful’s Great American Cleanup. The auction runs from April 16 through April 26. What have you made from recycled items? Love, Love the calla lillies. This is a must. You may want to add some scented oil so that when someone picks one up and automatically goes to sniff it, it actual smells beautiful. I would of never of even thought of doing this but they look great! Wow!!! These are lovely! These look very professional… great job! What a great idea, these flowers are beautiful! me encanta, hace poco recicle unas botas altas que tenia de cuero verdes para hacer broches en forma de maniquí. 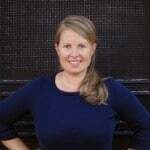 Tonia, you are so crazy creative! Love these, they turned out so elegant & lovely! This is so beautiful! I love how gorgeous your flowers turned out.